Join FAM's 30th Annual Hunger Walk! We know you share our concern for hungry neighbors in our South Orange County community. 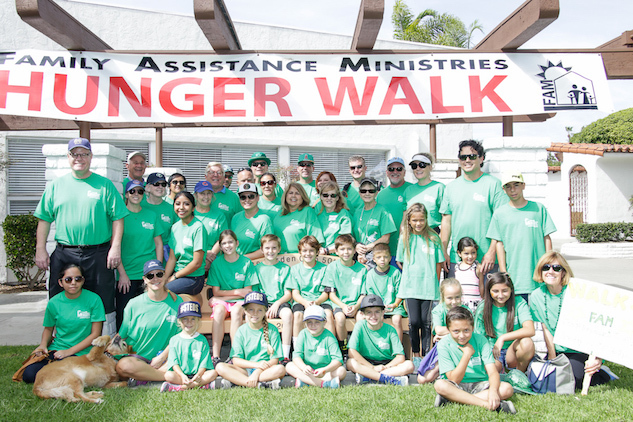 The Annual FAM Hunger Walk fundraiser is a fun walk beginning and ending at the San Clemente Community Center. The FAM Board of Directors and staff invite you to participate in our Walk by signing up and helping us raise money, becoming an official sponsor or making a donation. Unable to walk? Be a Virtual Walker by asking people to make a donation on your page just as if you actually walked! Activities Begin at: 12:30 p.m. Enjoy a fun 2.5 mile walk beginning and ending at the San Clemente Community Center. Help us reach our goal of $110,000! Currently FAM provides food to an average of 4,600 people each month. Last year, FAM redistributed just over $2 million in food and personal care items to the hungry and needy in our community. Last year, FAM distributed over $177,500 in assistance in the form of rent, utilities, transportation, medical and prescriptions, work force development, shelter and more to prevent hunger and homelessness.